Trump said sanctions against DPRK would be lifted "when we know the nukes are no longer a factor". Trump said Kim Jong-un had accepted his invitation to visit the White House sometime in the future. 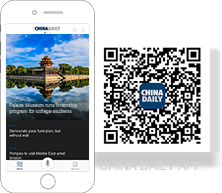 Trump said he would be ending joint military exercises between the United States and the Republic of Korea. 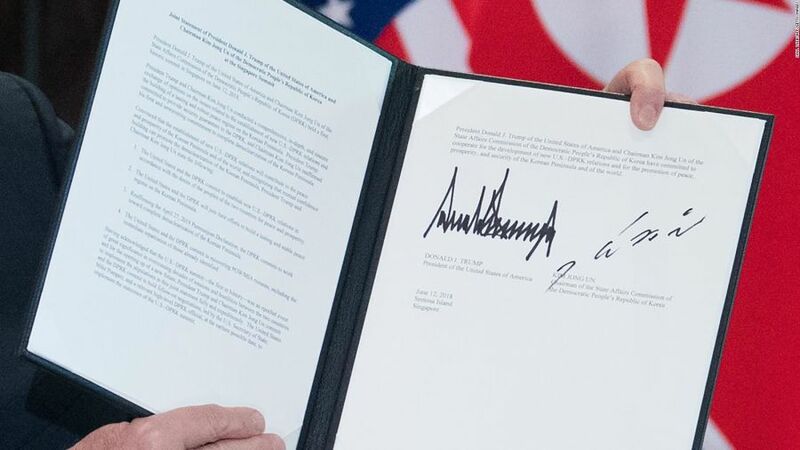 The document signed by Trump and Kim covers both the complete denuclearization of the Korean Peninsula and US security guarantee to the DPRK. 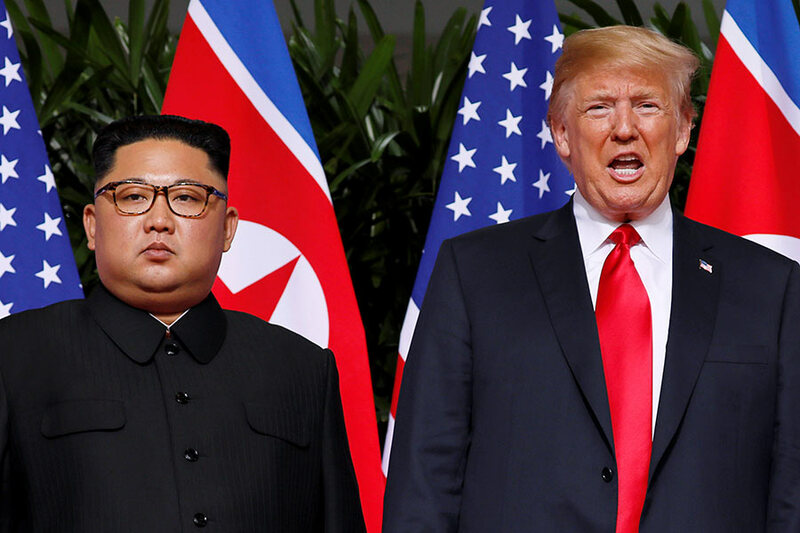 "President Trump committed to provide security guarantees to the DPRK and Chairman Kim Jong-un reaffirmed his firm and unwavering commitment to complete denuclearization of the Korean Peninsula," said the joint statement. Trump said he 'absolutely' would invite Kim to the White House. 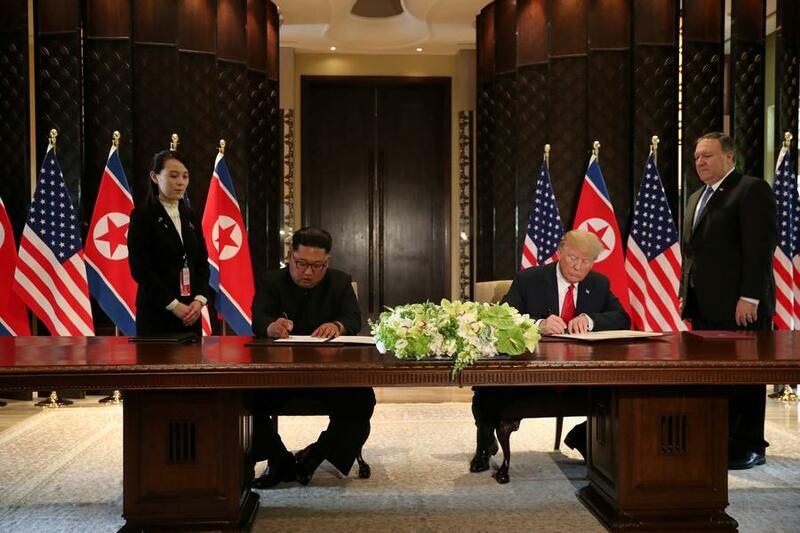 Trump and Kim signed a document on Tuesday afternoon, a document that Trump described as "very important" and "very comprehensive”. Kim declared "the world will see a major change" and he and Trump "decided to leave the past behind" during the signing ceremony. 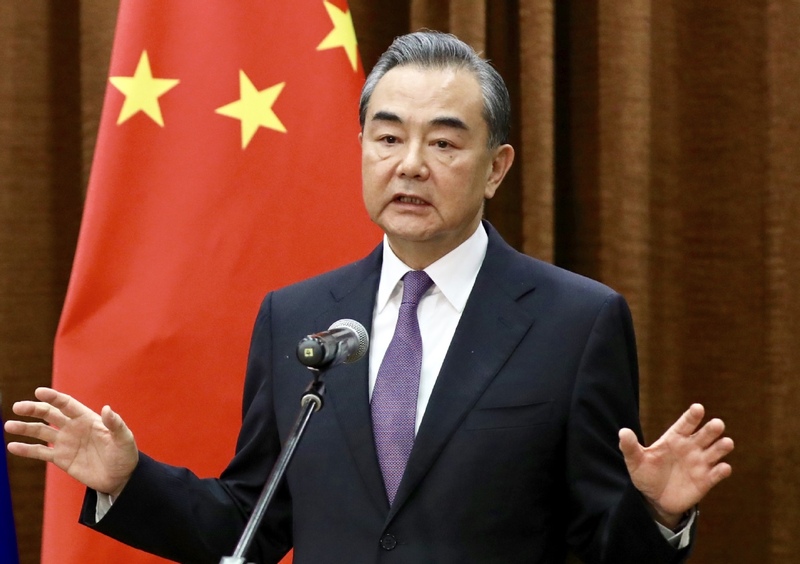 Beijing hopes the meeting between Washington and Pyongyang will result in substantive steps toward denuclearization and the establishment of a peace mechanism on the Korean Peninsula, State Councilor and Foreign Minister Wang Yi said on Tuesday. 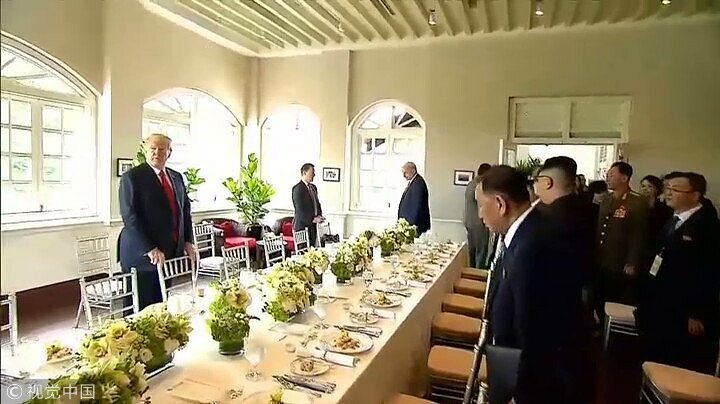 Donald Trump and Kim Jong-un emerged from working lunch before the summit ended in the afternoon. Trump told reporters that he and Kim were off to "a signing" after their working lunch and the talks had gone "better than anybody could have expected." 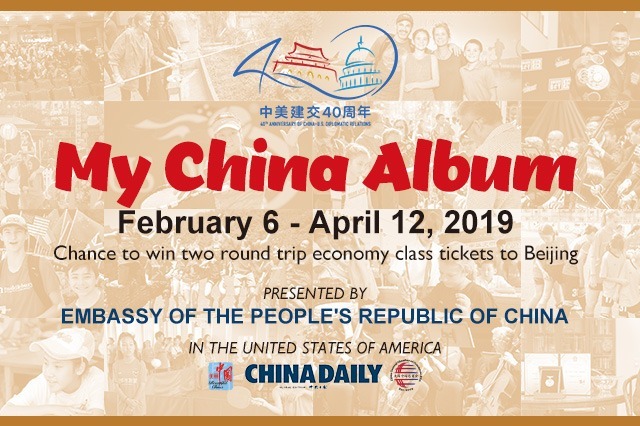 Donald Trump and Kim Jong-un chatted over a lunch of beef short ribs, sweet and sour crispy pork and braised codfish. 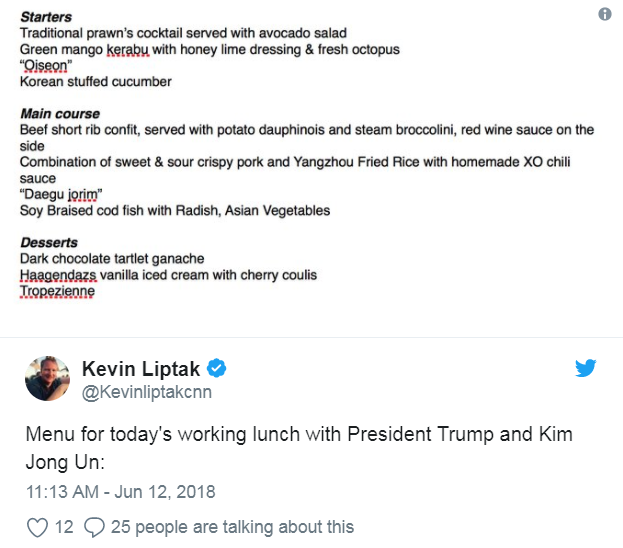 Details released by the White House show lunch began Tuesday with a prawn cocktail and avocado salad, and green mango kerabu with honey lime dressing and octopus. Trump said at the beginning of expanded discussions with aides from both countries that "We will solve a big problem" and "a big dilemma." 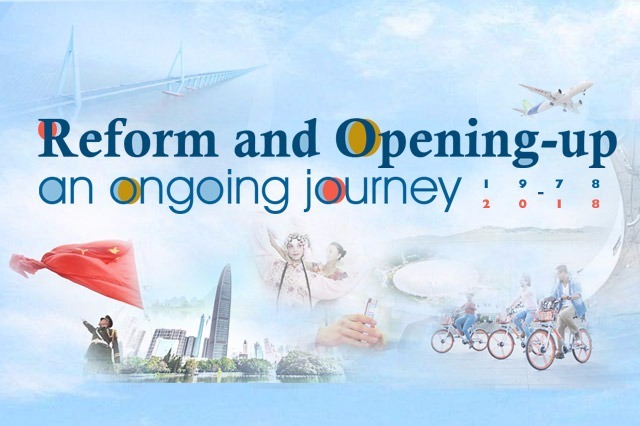 He talked about the pair achieving "tremendous success together" and predicts that "it will be successful. It will be done." President Trump and Kim Jong-un began their second series of talks after their personal one-on-one meeting concluded this morning. 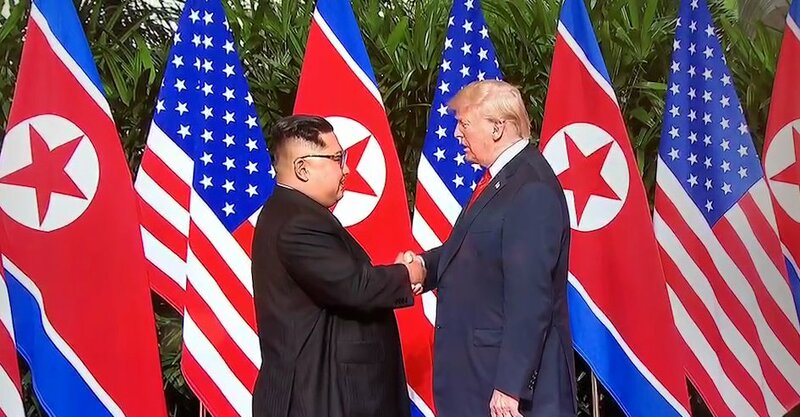 After leaving the first session of their summit, Trump told waiting reporters the meeting had been "very, very good." "Excellent relationship," he said from the balcony of the Capella Hotel. 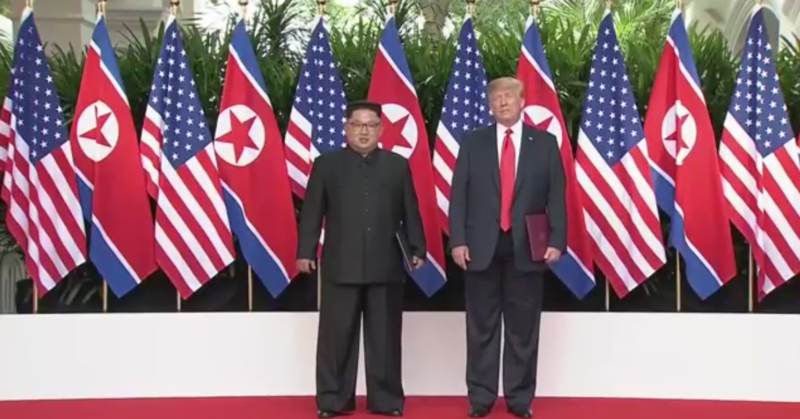 Donald Trump and Kim Jong-un left their one-on-one talk. They emerged from the talks together. Kim was smiling and Trump was chatting to Kim as they waved to press from the balcony of the hotel. 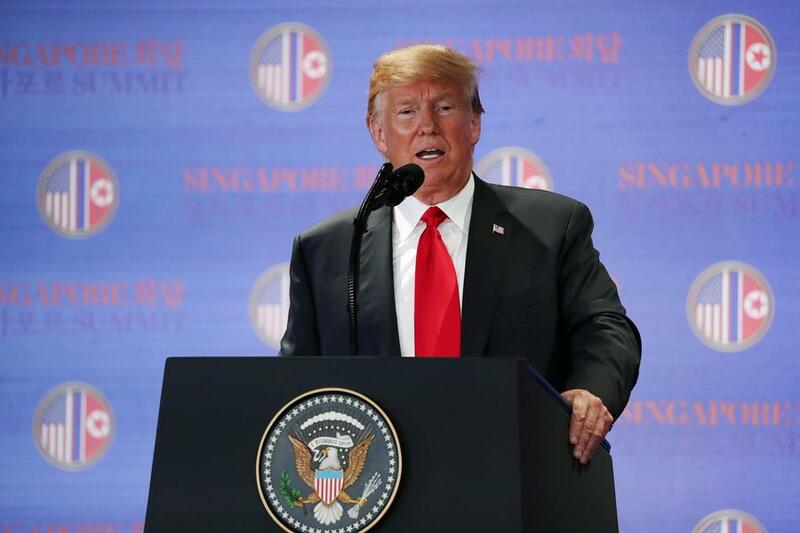 The Democratic People's Republic of Korea and the United States have overcome the obstacles of a difficult history to hold their summit in Singapore, the DPRK's leader Kim Jong-un said as the unprecedented meeting opened Tuesday. 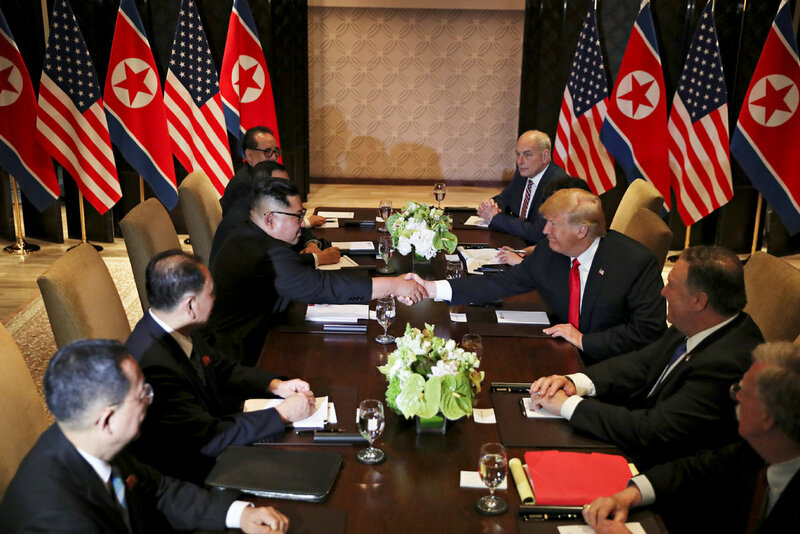 "The way to come to here was not easy," Kim said, sitting at a table with Trump. "The old prejudices and practices worked as obstacles on our way forward but we overcame all of them and we are here today." 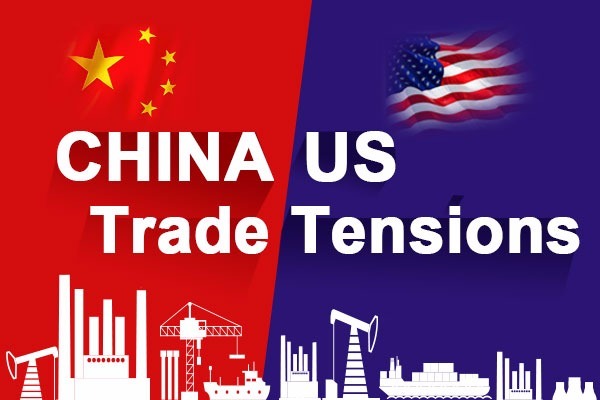 After the two sat down in the Capella hotel, Trump said the summit would be a tremendous success, adding that “we will have a terrific relationship, no doubt”. The two shook hands at 9:04 am after arriving at the hotel for the first summit between leaders of the two countries. The handshake lasted about 10 seconds. Both wore smile during the handshake, unlike the serious look when they arrived at the hotel. 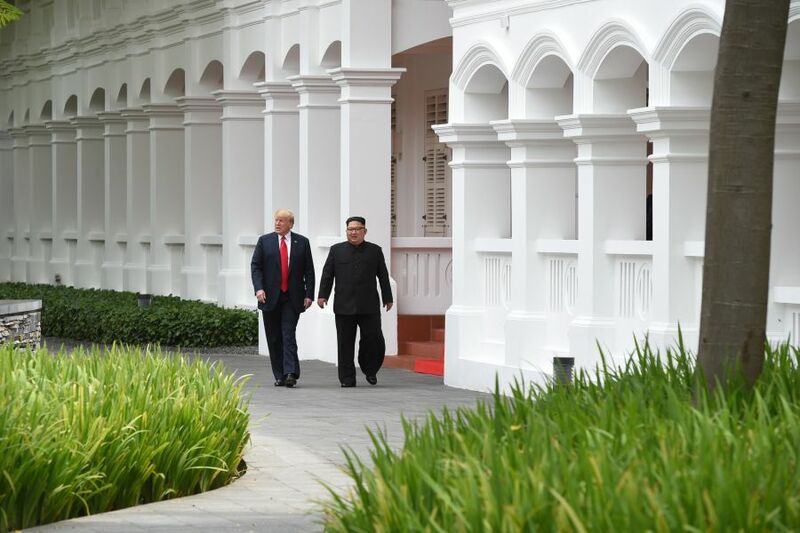 Democratic People's Republic of Korea leader Kim Jong-un and US President Donald Trump reached the venue of their historic summit in Singapore on Tuesday, after both sides sought to narrow differences over how to end a nuclear standoff. 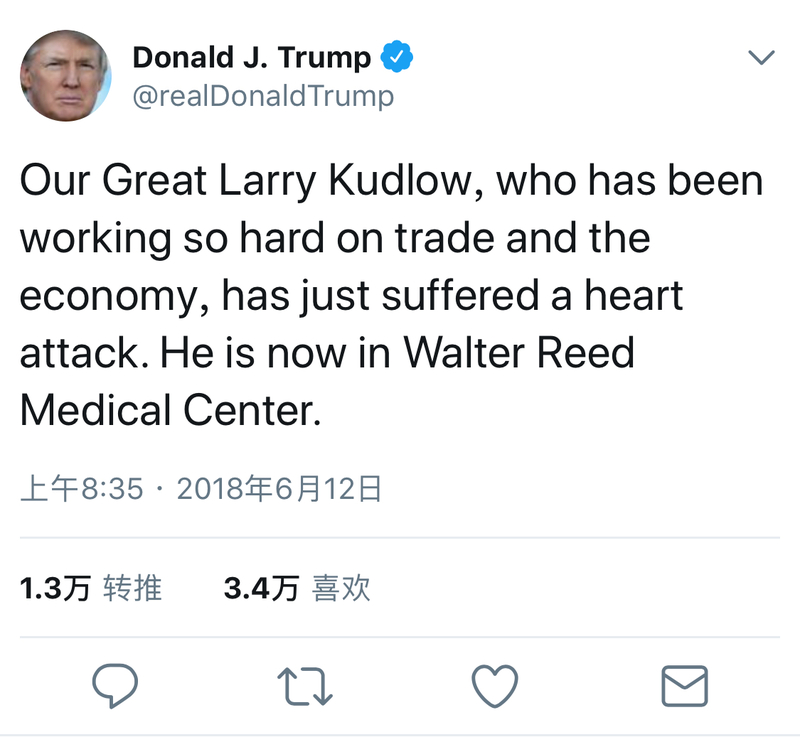 Top US economic advisor Larry Kudlow being treated for heart attack at Walter Reed Medical Center -- Trump tweeted, 25 minutes before he was set to meet with Kim. 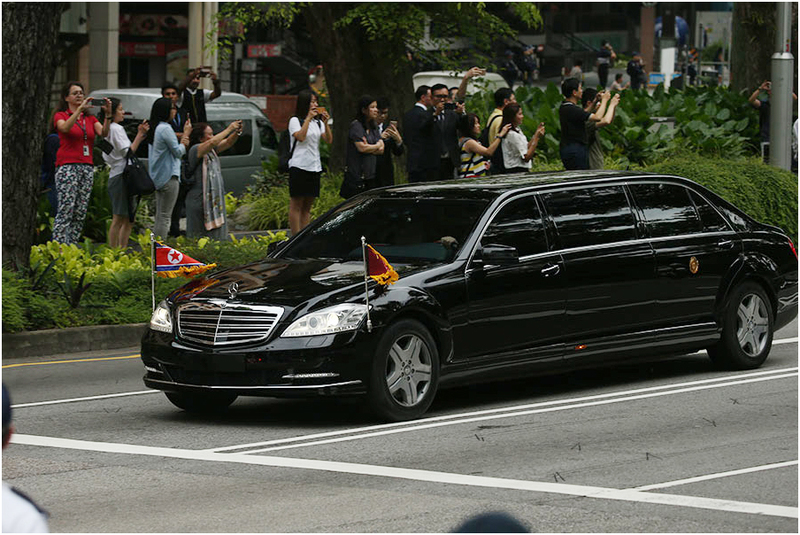 US President Donald Trump left the Shangri-La Hotel at 8 am Tuesday morning for the Capella hotel in Sentosa, an island resort off the south coast of Singapore, for a historic summit with Democratic People’s Republic of Korea leader Kim Jong-un. 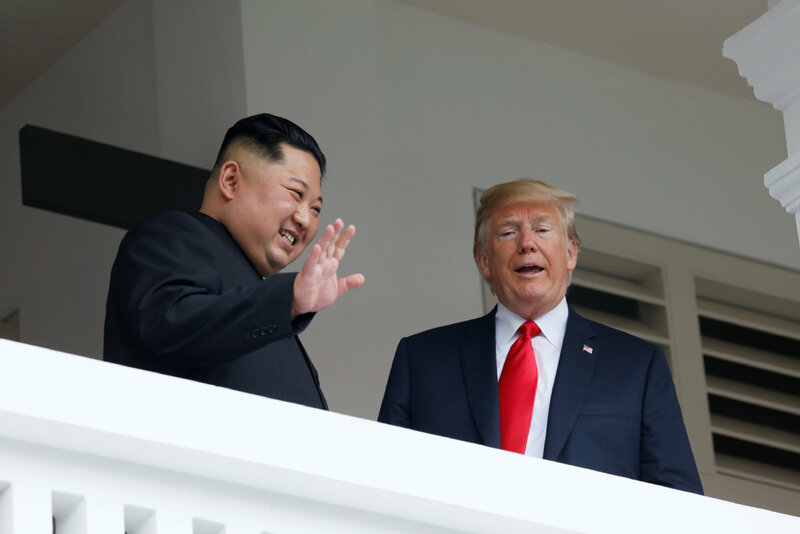 Analysts believe the success of the Trump-Kim summit will help boost Republican lawmakers in their midterm elections. Democrats have already threatened to impeach Trump if they win majority in the Congress.